National Geographic Children's Books, 9781426319198, 192pp. Move over Project Runway. Get ready to chuckle your way through centuries of fashion dos and don'ts! In this humorous and approachable narrative, kids will learn about outrageous, politically-perilous, funky, disgusting, regrettable, and life-threatening creations people have worn throughout the course of human history, all the way up to the present day. 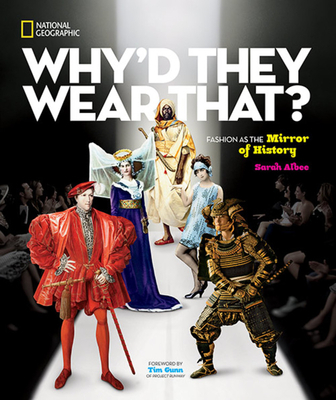 From spats and togas to hoop skirts and hair shirts, why people wore what they did is an illuminating way to look at the social, economic, political, and moral climates throughout history. SARAH ALBEE is the author of more than 100 children's books. She has had three of her books appear on the New York Times children's bestseller list. She currently has an upper-middle-grade, nonfiction book published in May, 2010 about the history of toilets and sanitation entitled Poop Happened! A History of the World from the Bottom Up, and a follow-up title under contract due out in 2013 about how insects have affected human history. She blogs daily on a variety of science and social history topics geared toward middle-grade readers (sarahalbeebooks.com/blog). She spent nine years as an editor at Children's Television Workshop, working primarily for Sesame Street and attending both the Bologna and Frankfurt Book Fairs. TIM GUNN (FORWARD) is a renowned fashion consultant, television personality, actor, and author. He has served as the chair of fashion design at Parsons New School for Design as well as chief creative officer at Liz Claiborne. He is well-known as the chief mentor to designers on the hit reality television series Project Runway and the headliner of spinoff shows Tim Gunn's Guide to Style and Under the Gunn. He is also the author of A Guide to Quality, Taste and Style as well as Tim Gunn's Fashion Bible: The Fascinating History of Everything in Your Closet.